Tiburcio Vasquez was born in Monterey, California, on 11th August, 1835. At the age of 17 he was accused of killing William Hardmount. He fled and became an outlaw. By 1856 he had his own gang and took part in stage holdups, robberies and rustling. Vasquez was arrested several times and served three periods in San Quentin Penitentiary. During a raid in 1873 at Tres Pinos three men were killed. Vasquez fled to Los Angeles where he carried out another robbery. Betrayed by a gang member, Abdon Levia, Vasquez was able to escape from his hideout after a shoot-out. On 26th December his gang raided Kingston and got away with $2,500. As a result of these crimes a reward of $8,000 was offered for the capture of Vasquez. An attack on a sheep ranch near Los Angeles ended in failure. Law officers received a tip off that Vasquez was hiding at the home of George Caralambo. A posse led by Albert Johnson arrested Vasquez after a shoot out. Seriously wounded he was taken to Salinas where he was tried for the murders committed at Tres Pinos. 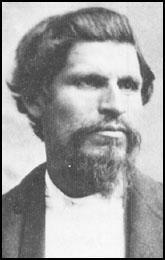 Tiburcio was found guilty of murder and was hanged at San Jose on 19th March, 1875.